Art is beautiful in its versatility; continually engaging and individually challenging us to peel away layers to derive more profound meaning. We all vary in our upbringings, our experiences, our thoughts, and feelings, which certainly means that we’ll all view it uniquely. If you quickly google search film theories I’m sure you’ll run into the usual “James Bond is only a codename,” “Willy Wonka was killing the kids and using them in the candy,” and my personal favorite: “Sean Connery was an elder James Bond in The Rock.” These few are the most popular, (which make up the small tip of a hulking iceberg in comparison) but there are theories for just about everything film & TV nowadays. Now, I love fan theories, and each of the aforementioned is worth a look if only for shits and giggles. Obviously, some are complete insanity, but there’s a few out there that make you pause in contemplation and wonder if the filmmakers had a deeper message gracefully and intentionally stitched into the fabric of their films, that of which exceeds standard subtext. 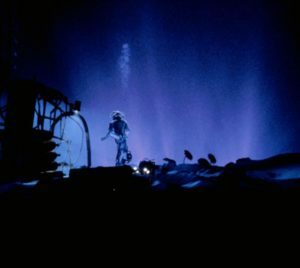 The Abyss is far from the most popular of films under James Cameron’s directorial belt. I get it: It’s a bit slow, (perhaps meditative? ), a bit pretentious, and mired with infamous production issues, but as with most art, the depths of The Abyss have much more to show us than the surface would indicate. QUICK NOTE: This article analyzes the Uncut Special Edition of the film. This quote greets us in the opening moments of the film — a quote from Friedrich Nietzsche’s work Beyond Good and Evil. 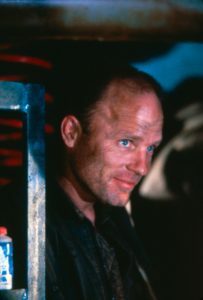 Just before this quote, Nietzsche states, “Whoever fights monsters should see to it that in the process he does not become a monster.” an apt starting point for Ed Harris’ Virgil (we’ll call him Bud) Brigman, and more importantly Michael Biehn’s Lt. Hiram Coffey. Nietzsche is primarily recognized as an atheist, which will assist us in establishing a base point for the spiritual arc this film will take from disbelief to belief, and more importantly, from darkness to light. In his first moments on film, we recognize that Bud isn’t the most collected and calm person, but he’s a relatable leader that holds the respect of his crew. He’s the everyman — full of conflict, hate, jealousy, anger, and fear, but also shows that he’s caring, thoughtful, and empathetic. There are many events in this film that should send Bud into the throes of insanity, but throughout, we witness that he possesses enough mental fortitude to resist in becoming Nietzsche’s monster. This is an essential piece of the enlightenment puzzle — facing your demons. Bud’s seclusion on Deep Core has provided him a safe barrier from his problems, mostly his ex-wife, Mary Elizabeth Mastrantonio’s Lindsay Brigman, but it’s her inclusion that provides Bud a mirror which reveals his every fault. Before her arrival we see Bud as a cool guy — bantering with his shipmates, getting along with almost everyone — but once she’s introduced into the situation, he becomes a different man entirely. We see an unbecoming side of Bud that flares into jealousy toward his Lindsay’s love life, exudes a general hatred toward her, and he seemingly enjoys picking fights with her – especially when it comes to (their ‘baby’) Deep Core. This event culminates with Bud storming into the nearest bathroom to callously toss his wedding ring into the toilet, where his marriage belongs. Bud has a moment that serves as a key to the entire plot of the film and, and in the context of this article, his first step toward enlightenment. A few moments after we linger on the bowl full of thick blue goo (think airplane toilet), Bud returns awash with regret and plunges his arm into the goo to retrieve the ring. 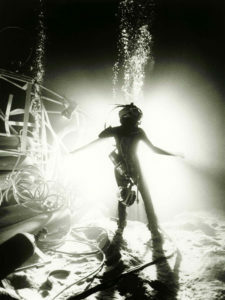 Having the ring, and harboring its symbolic love allows him to survive in a sequence where Deep Core is rapidly filling with water, a choice that plays into Bud’s ultimate journey. In this series of events, we witness Bud successfully facing down his faults — emotions that would have previously caused him to leave the ring in the drain of the toilet, which in turn would’ve led straight to his demise. Near the middle of the film, things begin to get a little screwy down in Deep Core. 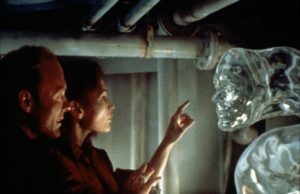 While excavating a submarine wreck with Lt. Coffey and the Navy, Lindsay comes face to face with an extraterrestrial organism (that’s 100%, undoubtedly an extraterrestrial) and tries to explain this fact to anyone who will listen. Coffey is completely cut from any contact with his storm-ridden and surfaced superiors, remaining convinced that he’s seen an advanced Russian submarine, and begins to further his trek into insanity and his ever-deepening journey toward becoming Nietzsche’s monster. With a few baby steps into his process of enlightenment, Bud stands sandwiched between the unknown and the very plausible. On the one hand, he has Lindsay pleading for him to believe what she’d seen. The other hand: A confirmed brewing war with the USSR, and a trained Navy SEAL who remains convinced with every fiber of his being that the Russians are attempting to steal a nuke from their base. On paper, this choice is relatively easy, right? I mean, trust the Navy SEAL. God only knows what kind of top secret information and knowledge of military technology he’s privileged to know. At first, that’s precisely what Bud chooses until the entire crew witnesses an anomaly for themselves, SEALS included. Upon his initial meeting with it, Bud is smiling – overcome with wonder and awe as they interact with it. Coffey proceeds to chop it in half with a fire-ax while under the assumption that it’s Russian technology, proving his mind is restricted by hatred and aggression, only able to process reality through a veil of darkness. The event shows us the difference between an open mind and a closed mind. Bud’s arc is fundamentally changing him, his thought process, his feelings — he’s finding new parts of himself that are aiding in becoming a new person. The most important of these: Forgiveness. Bud forgives the burden of the anger and pain attached to his relationship with Lindsay when he agrees with her, surpassing his stubborn ways and taking another step on his journey. Now cutting himself with a rather large blade under the table, Coffey can’t stand the talk of peace with these anomalies. He’s become the embodiment of darkness and evil; continually allowing hatred to fuel each of his choices. He wholeheartedly believes that the crew is about to gift a nuclear weapon to the Russians, can’t take it any longer, and decides to mutiny. Thus ensues a hand-to-hand tussle turned mini-sub chase which takes Bud and Coffey into the darkness of the abyss for their final battle. Cameron’s addition of the Nietzsche quote is almost misdirection. Yes, this is a film about how poisonous the darkness can be, but the quote seems only to embody Coffey’s character, and his alone throughout the film. Instead of encapsulating the film in a sentence, Cameron gives us Nietzsche as a warning and reminder of what Bud, and ultimately humanity itself, has strayed from on their way to spiritual evolution. After the mini-sub battle with Coffey, Bud and Lindsay remain trapped in their flooding sub. Bud tries to give her his helmet and air from his suit sacrificially, but she knows that Bud is a stronger swimmer, and knows he can bring her back after she drowns in the frigid water. In the process of reviving her, he simultaneously rekindles his love for her and his capability for love. Living in love is great and all, but It’s at this point in the journey toward enlightenment where Bud must show selflessness, in this case, he must disarm a nuclear bomb to save the crew, and possibly tension between nations. Where’s the bomb? In the dark void of the abyss, and on the other side of a suicide mission. In making his selfless choice, Bud begins parting himself from what attaches him to physical reality, which will allow his mind to accept what lies beyond the unknown. Now breathing the liquid oxygen, Bud descends into the abyss with the pull of weighted ankles. Eventually, he becomes overwhelmed with pain while returning to the fetal position. His communications become unreadable, and it seems that he’s at the edge of death when a soft purple light begins to bathe him from an unknown source. He begins to feel again, regaining his mental functions as he reaches the cliff harboring the nuke. 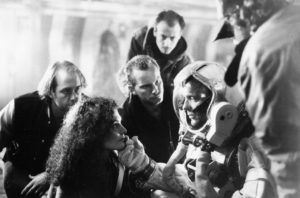 Bud disarms the bomb and must inform Lindsay and the crew that he lacks the oxygen needed to return to Deep Core.Yelling and sadness ensue among the crew, but Bud smiles in knowing that he’s done the right thing, and types “Love you, Wife” on his wrist communicator before laying in peace and accepting his fate. The purple glow is present during this entire sequence, and this is significant because while also representing the future; the color purple simultaneously represents the enhancement of spiritual evolution. In this case: Bud is bathed in that symbolism after showing he’s completed the reconditioning of his somewhat closed mind, embracing true love, and accepting his death for a better cause. When researching spiritual enlightenment, you’ll run into the word ‘ego’ and the phrase ‘ego death’ a lot. If you’re not familiar (and I don’t blame you if you aren’t), ego is what attaches our consciousness to this physical reality. When one experiences ego death or even partial death of the ego; one obtains the ability to expand and understand the depths and mysteries of life through an understanding of self. While relating this to the film, I believe this is the point where we can pronounce the old Bud Brigman dead and gone. Having plunged into the darkness of the abyss in a selfless act for humanity and love, Bud has released what keeps him physically attached to his life, what hurt and weighed on him, releasing his ego (at least most of it) away in the process. It frees his mind to accept, learn, and transform into an enlightened being while still in the embrace of the womb. A moment after his symbolic death, a being of pure light appears, taking him by the hand and guiding him toward a city built of purple structures and bright light where other light-beings peacefully meander with each other. We can look at this as the moment as Bud’s moment of enlightenment. With his consciousness now expanded, he’s able to travel past the abyss — the darkness and the boundaries of the human mind — sending him into a reality that he couldn’t possibly fathom (no nautical pun intended), and becoming the first human being to traverse the greater mysteries of the universe. After flying through the city of light, the light-being escorts Bud to a room that creates an artificial atmosphere which allows him to remove the helmet, thereby freeing him from his symbolic womb as he chokes air for the first time as his new self. He now faces three of the light-beings, and regarding my theory, the number three has significant relevance to Bud’s journey. The number three is representative of man itself – a being made from mind, body, and spirit; existing as an intermediary between the sky and the earth (Earth, man, sky), the three cycles of life are past, present, future. There are so many valid interpretations of the number three when it comes to the subject of enlightenment, living in love and constant positivity, being guided by guardian angels – I could write an entire article on that topic, but I digress. Bud is enlightened now, at the peak of his journey and in a place where he’s face-to-face with the sacred number three in the form of the three light-beings. With what we know of the number three, maybe we can view this as Bud facing his inherent properties, perhaps the scared properties of the universe? At this point, Bud (I think it’s safe to call him Virgil now) has faced his inner demons. He’s opened his mind to the possibilities of the unknown, been through the processes of (ego) death, rebirth, and now exists in a perpetual state of love and light. And after all that he’s become the ambassador of the human race as aliens bring up a worldwide tidal wave to annihilate humankind. One hell of a day. After the Aliens spare humanity, we’re back in the ship with the crew where Virgil (for the first time) refers to himself as Virgil on his wrist communicator, a name which he’d obviously been uncomfortable with and embarrassed to use throughout most of the film. Cameron has Brigman embrace his original name in the film’s final moments to cement the symbolic change he’s gone through and to finally complete the arc which leads him from everyman to enlightened one. Bud’s just a name, but Virgil? It’s an English name meaning flourishing – indeed a state in which his mind currently exists. Virgil’s journey has led him to this moment, or I should say, lead him to the moment right before his “death” where he disarmed the bomb to avoid conflict. As he’s pleading humanity’s case to his alien hosts, they reveal footage of the Russian and American armies amassing and quickly heading toward war, and to hammer home the question “why should humanity be spared?”, they bring up images of concentration camps from World War II, mushroom clouds spreading destruction, and human violence… but they hold back, recede the tidal waves… “You could’ve done it. Why didn’t you?” Virgil asks. We learn that the aliens had witnessed Virgil’s love and selfless act among the looming war on the surface. He has led himself to this moment by each of his Karmaic choices made during the film, and if it had been anyone else with that bomb (especially Coffey), Earth would have been destroyed. In completing his enlightenment, Virgil’s message to the Aliens is more than “don’t do it,” he’s preaching that humanity in its entirety holds the capability of evolving past their current war-like state and into the next steps of their actual existence. It’s obvious that Cameron had a message he wanted to share with the world that reads “War is bad. Be better”, but The Abyss is much more than a glorified PSA for world peace. Intended or not, Cameron has presented us with a story that chronicles the first moments of the next step human evolution; one that’s rife with spiritual symbolism. It’s a reminder of what the human mind and spirit are capable of and the limitless bounds of which an evolving consciousness can allegedly reach.